Ronald McDonald House Southern & Central Alberta is receiving vehicle donations from across the province. Who is impacted by their mission to keep families close while children are in hospital? Ronald McDonald House keeps families together. Imagine learning that your child is ill and you will need to travel to a different city to receive the medical care they need. In the midst of your worst nightmare as a parent, you must now also leave your home, your job and your support system. This is the reality for more than 70 per cent of Canadian families with seriously ill or injured children. Your vehicle donations are helping make care for these families possible! Since first partnering together in 2015, Donate a Car Canada has facilitated the donation of dozens of vehicles for RMH. Donors from High Prairie, Crossfield, Sundre, Canmore, and beyond have gifted recycle-ready, and auctionable cars. One Rocky Mountain House donor donated 6 vehicles at one time! Many donated vehicles are recycle-ready. These cars, trucks, motorcycles and holiday vehicles are priced based on an ever-fluctuating metal market. From time-to-time, a donor will give a donation that has re-sale potential. These vehicles are sold as-is to the highest bidder. One Yaris donated from Bragg Creek drew a donation of $989.30 to RMH! Company vans. Trusty old Hondas. The net proceeds from the sale of each vehicle is sent to the charity at the end of the month. No fees are ever charged to the charity. 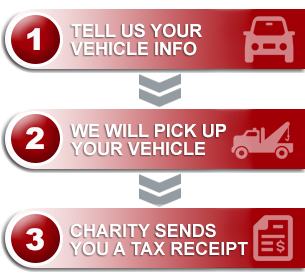 You will receive a tax receipt that reflects the amount that RMH receives from your vehicle donation. Last year, 590 out-of-town families stayed at the Houses in Calgary and Red Deer. An additional 1,314 local families received health services through the RMH Care Mobile Program. If you would like to give to Ronald McDonald House in other ways (not everyone has a donation-ready car sitting in the drive way! ), ask them about their wish lists. They may be looking for things like baking supplies, toiletries, recreation and craft materials. They appreciate pick-me-up gifts for their families. Donated items help keep costs low. This ensures they can continue providing a home away from home for hundreds of families each year. And if you do have a car, truck, motorcycle, or some other unique 4-wheeled wonder to share, connect with DACC! They’ll take care of all of your donation particulars, ensuring your gift gets into the hands of the cause you care about.